On Saturday 13 June in Bristol Lama Jampa gave the second part of the Kadampa master Geshe Se Chilbupa's commentary on Geshe Chekhawa's 'Seven Points of Mind Training' to around 120 people. This part of the profound teaching focused on conventional bodhicitta, the wish to become a Buddha for the benefit of all sentient beings, and gave comprehensive advice on how we can utilise the difficulties that arise in our lives by transforming them into the path. Everyone was very happy to receive these precious teachings and there were opportunities for questions at the end of the morning and afternoon sessions. It was a joyful experience to return to the Friends Meeting House once again, where H.H. Sakya Trizin bestowed the two-day initiation of Chakrasamvara and the blessing of Vajrayogini in 2002. The Dechen Dharma School was also a success with the children who were present learning about impermanence and reciting prayers to Chenrezik together. 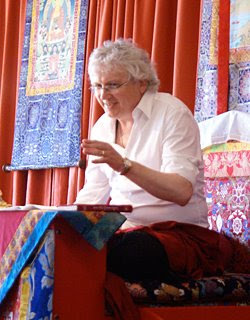 On Sunday 14 June, due to the success of the group in Bath and the number of people who have taken refuge recently in both Bristol and Bath, Lama Jampa kindly bestowed Bari Lotsawa's Chenrezik Mahamudra initiation and gave the reading transmission for the sadhana by the remarkable Ngorpa master Ngorchen Konchog Lhundrup, thus enabling the Bath group to start practising the Chenrezik puja together on a regular basis. Around 40 people attended this initiation which was the first for several years held in the beautiful shrine room at Sakya Thinley Rinchen Ling.